Background and objectives Octogenarians frequently require maintenance hemodialysis (HD) for treatment of stage renal disease ESRD. Although the Fistula First Initiative recommends creating an arteriovenous fistula as the preferred dialysis access method, vascular access selection should be based on life expectancy and functional status at treatment initiation. Design, setting, participants, & measurements This is a retrospective analysis of 4-year outpatient data (January 1, 2004 through December 31, 2007) of incident octogenarian dialysis population in an academic institution. Thirty-nine of 268 patients were octogenarians with a mean (± SD) age of 83.4 ± 3.4 years, and 25 were men. Kaplan–Meier survival and Fisher's post hoc statistical analyses were performed. Results Thirty-seven octogenarian patients selected HD and two selected peritoneal dialysis. Among the 37 HD patients, 29 initiated dialysis with a tunneled cuffed catheter, 6 with an arteriovenous fistula, and 2 with an arteriovenous graft. Three patients regained renal function after an average 112 days and one was lost to follow-up. Of the 33 remaining on HD, 8 required nursing home admission and 25 were discharged home after initiating HD. Among these 33, 19 died and 14 remained on HD at the end of study period. Days on dialysis (mean ± SEM) before death in those discharged to a nursing facility versus home were 52.6 ± 14.7 versus 386.1 ± 90.7 (P < 0.05), respectively. Conclusions Vascular access planning should include assessment of functional status and life expectancy in octogenarian HD patients. The United States Renal Data System (USRDS) projects that the number of Americans needing dialysis will reach 784,613 by 2020 (1). Since the early 1990s, the fastest growing segment of the United States population has been the ≥65-year-old age group (2). Since 2000, the adjusted ESRD incident rate in those aged 75 years and older has increased by 11%, to 1744 patients per million individuals (1). Renal replacement therapy in elderly patients raises several critical issues such as life expectancy, quality of life, and other moral, ethical, financial, social, and legal issues. The Fistula First Initiative recommends creating an arteriovenous fistula (AVF) as the preferred dialysis access method. However, physicians have differing views on this subject, and the choice of access (AVF versus arteriovenous graft [AVG] versus catheter) can pose a challenge for nephrologists treating the octogenarian group. Even before this choice is made, the nephrologist faces the dilemma of whether or not to initiate hemodialysis (HD) in this elderly patient group. Dialysis access issues in octogenarians have not often been discussed in the literature. This retrospective study was designed to provide insight into these delicate issues by studying outcomes and vascular access planning in octogenarian patients. We reviewed medical charts from a 4-year period from patients in a single center and studied the survival rates of these patients after dialysis. Our aim was to highlight the importance of examining functional status and life expectancy before selecting the type of vascular access in the octogenarian population who opt for HD therapy. The retrospective chart review study was approved by the Institutional Review Board of Wake Forest University School of Medicine (WFUSM). All incident octogenarian dialysis patients who were discharged from the hospital to continue HD treatments at WFUSM outpatient dialysis facilities over the 4-year period from January 2004 to December 2007 were included. Hospital medical records and the outpatient dialysis database were used to collect study data. Data collected included date of dialysis initiation, type of access at initiation, date of permanent access placement, date and place of discharge, associated comorbid conditions specifically related to the octogenarian population (dementia, history of fall in the previous 12 months, and mobility concerns), death with an unused functioning access, and number of days on dialysis. Predialysis clinic data were studied to evaluate dialysis vascular access trends in octogenarian patients with chronic kidney disease (CKD). For each patient, we collected a maximum of 18 months of data, beginning with the initiation of renal replacement therapy and abstracting all data from the subsequent 18 months or until death. Survival analysis was performed using log-rank test with SigmaPlot 11.0 software. The survival curve was plotted using Kaplan–Meier curve. A total of 268 patients, of all ages, were initiated on HD and 28 on peritoneal dialysis (PD) during the study period. Thirty-nine octogenarian (39 of 268; 14.5%) patients formed the study group, 25 men and 14 women. Thirty (76.9%) were being followed in the predialysis clinic and the remaining were acute starts from recent hospitalization. Of the 39 total, 37 patients opted for HD and 2 for PD. The mean age of study patients was 84.3 ± 3.4 years. Among the 37 HD patients, 29 (78.3%) initiated dialysis with a tunneled cuffed catheter (TCC), 6 (16.2%) with an AVF, and 2 (5.4%) with an AVG. Associated comorbid conditions included hypertension (35 of 39; 89.74%), diabetes mellitus (12 of 39; 30.76%), coronary artery disease (19 of 39; 48.72%), chronic heart failure (15 of 39; 38.46%), cerebrovascular accident (16 of 39; 41.02%), and chronic obstructive pulmonary disease (8 of 39; 20.51%). Dementia (10 of 39), history of fall in the preceding 12 months (21 of 39), poor vision (8 of 39), and inability to transfer from bed to chair (8 of 39) were other comorbidities noted in this octogenarian population. Seventy-nine percent of the 268 patients initiated HD with a central venous catheter, 16% with an AVF, and 5% with an AVG. Forty-six percent of the incident population with a central venous catheter had an fistula AVF that was maturing at the time of HD initiation. Additional permanent accesses were placed in the first 90 days for 12% of those initiating HD with a central venous catheter. Fifty-eight percent of the prevalent HD patients had a functioning fistula AVF (3). One hundred seventy-three octogenarian patients with CKD stage 3 and 4 were followed during the study period. Fifty-three (30.6%) died of nonrenal causes before requiring renal replacement therapy. Twenty-five (14.4%) were referred for vein mapping and had an fistula AVF placed pre-emptively. Eight of these 25 (32%) died of nonrenal etiologies before needing renal replacement therapy. Table 1 outlines the outcome in patients after initiating renal replacement therapy. Three patients regained renal function after an average of 112 days and one patient was lost to follow-up. Of the 33 dialysis-dependent patients, eight (24.25%) required nursing home admission, whereas 25 patients (75.75%) were discharged to their homes. Among these 33 patients, 19 (57.5%) died and 14 (42.4%) were alive on HD at the end of 18 months. 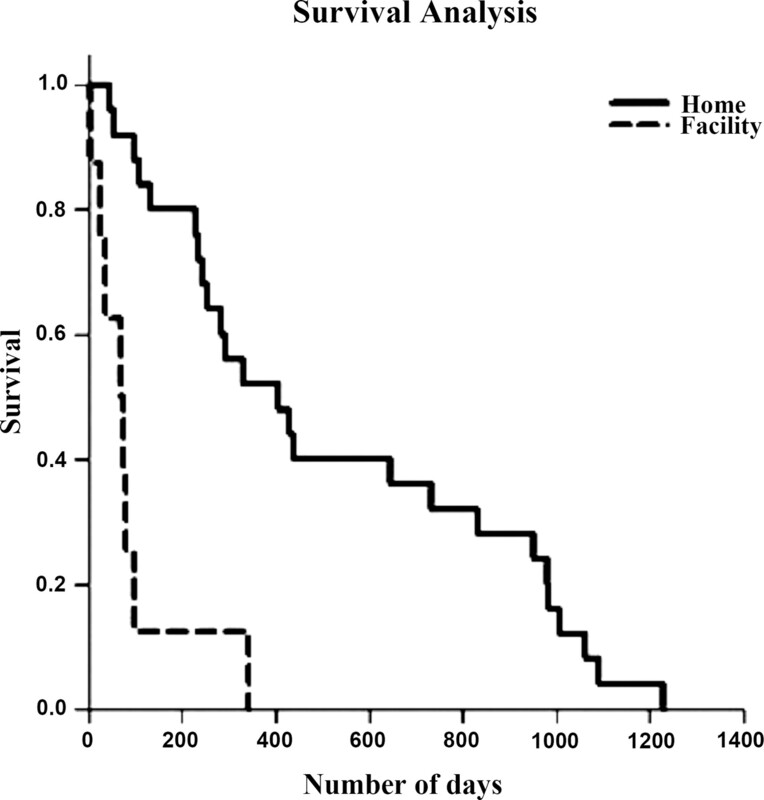 The Kaplan–Meier cumulative survival plot for duration on HD revealed that the mean (± SEM) number of days on dialysis before death in those discharged to a nursing facility versus home was 52.6 ± 14.7 versus 386.1 ± 90.7 (P < 0.05), respectively (Figure 1). No deaths were related to TCC-related infection. Nine patients died after voluntary withdrawal from dialysis, and eight remaining on HD died because of necrotizing pneumonia, sepsis, failure to thrive, and malignancy (two per cause). Chronic heart failure was reported as the cause of death in one patient, whereas one patient died of unknown cause. Kaplan–Meier cumulative survival plot for duration on hemodialysis. The subgroup of 19 patients who either withdrew from dialysis or died while on dialysis was analyzed further to determine the utility of creating a permanent vascular access. Eighteen of these patients were initiated on HD and one on PD. Sixteen (88.8%) of the patients initiated HD with a tunneled catheter and two (11.1%) with an AVF. Ten of these patients (55.5%) died in <180 days. Out of those, seven patients (70%) had an AVF created soon after initiating HD, but they died before the AVF could mature for cannulation. Institute of Medicine (IOM) published guidelines to evaluate the suitability of initiating dialysis in patients for whom the “burden of renal replacement therapy (RRT)” outweighs the beneficial effects in 1991. Recognizing significant negative effect on the quality of life of elderly patients with existing comorbidities, the guidelines identified three groups of patients for further evaluation for the need for dialysis (4). Briefly, (1) patients with irreversible, profound neurologic impairment, (2) terminally ill patients from a nonrenal cause, and (3) patients with medical condition that precludes the technical process of dialysis may be denied dialysis. The guidelines further state that, in such patients, palliative care and/or a time-limited trial of dialysis may offer the best recourse (5,6). In the latter case, the trial may help the family and the patient decide whether long-term dialysis would be appropriate (7). The current study shows that 30.6% of the octogenarian CKD patients died of nonrenal causes before the actual need for renal replacement therapy. In a study of veterans over 70 years of age, the cumulative 1-, 3-, and 5-year survival rates after dialysis were found to be 60%, 37%, and 20%, respectively (8). Munshi et al. reported 1- and 5-year survival rates in HD patients aged 75 years or older as 53.5% and 2.4%, respectively, with roughly one fifth of their time being spent in a hospital. The authors concluded that very elderly patients with ESRD on renal replacement therapy had poor survival and quality of life (9). In our series, 25.6% had dementia and 20.6% were nonambulatory, contributing to the high mortality rate in this population. The assessment of an elderly CKD patient for functional status and specific morbidities such as dementia, frailty, ambulatory status, and social support structure are important factors in the consideration of CKD management in the elderly (10–12). Kurella et al. reported in the very elderly population survival after dialysis initiation was often poor and was substantially lower than that of the age-matched population, with only 54% of the cohort remaining alive after 1 year. Additionally, the very elderly CKD patients are at a significantly increased risk of decline in cognitive function (13,14). In our series, 13 of the 16 patients (81.25%) who were alive at 18 months and on dialysis had a functional AVF and 3 patients (18.75%) had a functional AVG. Our results suggest that overall poor functional capacity and limited life expectancy are factors that must be considered for ideal vascular access planning. As opposed to the very sick elderly population, an attempt to place a permanent access should always be made in relatively healthy elderly patients or in those with expected survival of >180 days. We believe that the added morbidity and cost could be reduced if permanent access is placed only in patients whose life expectancy exceeds 180 days. Should AVF Be Chosen for Access in All Elderly Patients? The guidelines from the Fistula First Breakthrough Initiatives recommend attempting an AVF in suitable dialysis patient with the goal of achieving access via an AVF in 66% of prevalent dialysis population. However, the interpretation of a “suitable” dialysis patient is left to the treating nephrologist to decide. Several studies have evaluated the effect of age on AVF patency rates, with conflicting findings (15–19). Chronological age alone should not be an exclusion criteria for vascular access planning (8,17,20–22). Weyde et al. analyzed data from 131 patients >70 years of age in whom an autogenous AVF was considered. Despite their multiple comorbidities, a successful AVF was created in 81.6% of the study population that survived >3 years and was very similar to our result of 81.2%. Both these studies highlight the key role for consideration of life expectancy during vascular access planning in the very elderly CKD population (17). Several studies have reported morbidity and mortality benefits of AVF compared with AVG and TCC (23,24). However, octogenarians are a vulnerable patient group and data regarding their outcomes after AVF surgery are conflicting. Access planning in the elderly is vastly different from that in younger patients. Comorbidities, functional status, life expectancy, and social factors should play a major role in the decision-making process. To determine if fistulas should be the preferred option in elderly patients, Richardson et al. analyzed outcomes after AVF surgery in 48 elderly patients and reported only eight AVFs being accessed for dialysis, suggesting that, despite K/DOQI guidelines (which do not have recommendations for specific age groups), AVFs may not be the best option in patients over 70 years of age (25). Another study found that the intervention and survival rates were similar among older (>65 years old) and younger (<65) dialysis patients after radiocephalic and brachiocephalic AVF. However, the study did point out the increased fistula maturation failure in elderly patients compared with their younger patients (26). Chan et al. demonstrated that old age alone was not a predictor of lower patency and/or mortality rates in these patients, regardless of existing major comorbidities like diabetes. The authors concluded that the potential benefits of AVFs compared with AVGs and TCCs cannot be universally applied (27). Physicians also need to determine the ideal site before creating AVF in the elderly, as this may play a role in the maturation of the AVF. A meta-analysis of studies comparing the patency and risks of AVFs in elderly versus nonelderly patients found a statistically significantly higher rate of radiocephalic AVF failure in elderly patients compared with nonelderly patients. On the basis of this analysis, it appears that radiocephalic fistulas are more likely to fail in elderly patients who may instead benefit from the creation of proximal autologous brachiocephalic fistulas (28). Another consideration in elderly patients is the length of time needed to achieve AVF maturity, especially when weighed against the patient's life expectancy. Additionally, besides age and multiple comorbidities, the surgeon's experience plays a vital role in the selection of a suitable primary vascular access method (29–31). A study comparing AVF versus TCC usage in elderly patients showed that the AVF group required a longer time to get functional permanent access compared with the TCC group. Additionally, the AVF group required multiple temporary catheter placements associated with an increased rate of infection, and central vein thrombosis. It appears that although AVFs are the recommended access route for all patients, in elderly patients an AVF placement is likely to cause more complications and infections if sufficient time is not provided for the AVF to mature. In such patients, using AVG as an alternate primary access could be considered to avoid TCC (32,33). Atherosclerosis in elderly patients increases the primary failure and thrombosis rates of AVF (22). Despite these drawbacks, native AVFs in ideal patient populations are superior compared with AVGs and TCCs because of the smaller number of endovascular or surgical interventions, improved patency, and longer overall survival rates once functional (34). Associated morbidity, cost, and optimal use of resources (including time) should be focused on patients who would benefit the most from a procedure. The futility of blindly subjecting every octogenarian to AVF surgery should be avoided, and individual assessments of life expectancy, comorbidities, social structure, quality of life, and functional status should be an integral part of the algorithm when planning vascular access. Although the present study used a small sample size, very elderly populations with CKD are unique, as issues involving vascular access planning in octogenarians are often complex and time consuming. A larger multicenter cohort would be useful to validate the observations from this single-center study. With this being a retrospective study, we could not assess the true functional age and status of the patient, which should be done as part of the decision process of treating elderly patients with CKD. Elderly CKD patients with poor functional capacity and multiple comorbidities have lower survival rates. As the life expectancy of the octogenarian CKD population is short, the AVF creation in this population is not always an ideal approach when compared with the younger CKD patients. Besides proper assessment of functional status and life expectancy, vascular access planning in octogenarians should consider potential time for AVF maturation and efforts involved in arranging the surgical procedure to justify subjecting these patients to AVF surgery. Alternative dialysis vascular access and/or modality should be considered in treating very elderly CKD patients. This work was published as an abstract: J Vasc Access 9[Suppl 1]: S16–S17, 2008. We thank Amanda Goode, Research Programs Development Manager, Department of Internal Medicine, WFUSM, for invaluable editorial assistance with manuscript writing.